William Shakespeare (1564-1616) is without a doubt one of the greatest writers of the English language. He has written some great poems and over 39 surviving plays over a period of only twenty years. His first play, The Two Gentlemen of Verona, was written between 1589-93, and the last one, The Two Noble Kinsmen, during 1613-15. In between, he created several other outstanding works, including the world’s famous Romeo and Juliet, Hamlet and Henry VI. 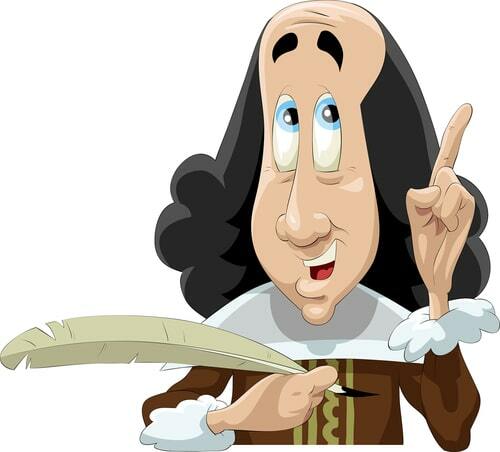 The language in which Shakespeare wrote is referred to as Early Modern English, a linguistic period that lasted from approximately 1500 to 1750. The language spoken during this period is often referred to as Elizabethan English or Shakespearian English. It falls between two major linguistic stages in the history of English: Middle English, the language written and spoken during the Middle Ages, most famously by Chaucer, and Modern English, the language we write and speak today. By the end of the 16th century, the English language had changed significantly from Middle English, and was in many respects very close to what we speak today. The plural and possessive <-s> were already markers on nouns, for instance changes and lover’s perjuries. While the use of the apostrophe for genitive expressions was not fully established until the 18th century, Shakespeare used it in his plays. Negatives were no longer marked with the older ‘ne’ but instead by ‘not’. Adjectives started appearing in comparative and superlative forms, using the suffix <-er> as a marker of comparatives (e.g. better) and <-est> for superlatives (e.g. fastest). Furthermore, adverbs were now formed with a <-ly> suffix (e.g. faithfully). However, some differences were still noticeable. There was a continuous use of the <-st> inflection on verbs in combination with the second person singular present, for instance thou knowst (= you know). In addition, there was a distinction between the second person singular pronoun thou and you. The two pronouns were used as a marker of social difference. Generally speaking, thou was used by superiors, whilst you had to be used by inferiors. In Old English, thou was singular and you was plural, but during the 13th century, you started being used as a polite form of the singular. People copied this from French where vous was used in that way. However, this feature was in decline by the late 17th century. It was not only the grammar that changed during the Shakespearian time. Regarding the lexis, many words were mostly borrowed from Latin and French because English was seen as an informal language and not sufficient enough to express new terms in the fields of religion, science, music and theology. To form new words, word-formation processes started to be productive mainly during the Early Modern English period. According to the Oxford English Dictionary, there are 357 instances where Shakespeare is the only recorded user of a word in one or more of its senses. Word-formation processes included derivation, the addition of a prefix or suffix to a root (e.g. <-un> + satisfied = unsatisfied); compounding, putting two roots together (e.g. gentle + man = gentleman); and clipping, reducing a word to one of its parts (e.g. etiquette = ticket). The London Globe Theatre specialises in original productions of Shakespeare. It is known for its original practices and always uses authentic costumes, music, instruments and movements around the stage. The first Globe Theatre burned down in 1613 during a performance of Henry VII and was reopened in 1994. The first play which was performed in Original Pronunciation, Shakespeare’s 400 year old accent, was not until 2004, though. The Globe producers of Romeo and Juliet thought that nobody would understand that original accent but it was a very successful occasion. It was indeed so flourishing that there was a second Original Pronunciation production of Troilus and Cressida in the following year. The phonology, or sound system, was changing very rapidly during the Early Modern English time. The remaining diphthongs were lost, e.g. /ai/ became /ɑː/ and /au/ became /ɔː/. There was also a loss of /ə/ in final syllables and /kn/ was reduced to /n/ in most dialects. But how do we know what the pronunciation of this time was like? Sometimes, writers of that period commented on the pronunciation of their words. For instance, the dramatist Ben Jonson states that the /r/ was pronounced after a vowel in one of his works. He calls it a ‘doggy sound’ because it sounded somewhat like ‘rrr’. Writers also used different spellings during that time, e.g. the word film was spelled ‘philome’ in Romeo and Juliet. Lastly, there are many rhymes and puns that do not work with a Modern English pronunciation.